Posted on 27, June 2016 by EuropaWire PR Editors | This entry was posted in Italy, Russia, Transportation & Logistics and tagged Leonardo-Finmeccanica, logistics hub, Novosibirsk, Russian Post, Tolmachevo International Airport. Bookmark the permalink. ROME, 27-Jun-2016 — /EuropaWire/ — A joint project between Leonardo-Finmeccanica and Russian Post to build a logistics hub at Tolmachevo International Airport inNovosibirsk will be implemented following a new agreement signed at the International Economic Forum in Saint Petersburg. The project will further strengthen the strategic cooperation betweenLeonardo and Russian Post. Leonardo will provide a turn-key solution based on innovative sorting technology, making it possible to automate the processing and management of a full range of postal products. This extends from standard and registered letters to parcels and packages, nationally and internationally. 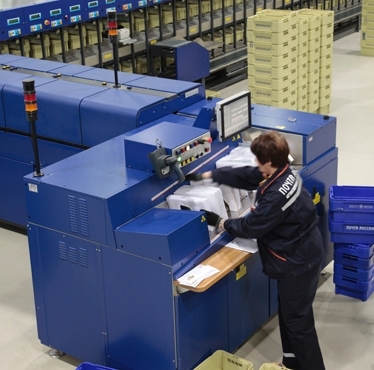 The logistics hub will streamline the flow of post in and between the regions of Novosibirsk, Omsk, Kemerovo, Tomsk and Altai and internationally.The sorting systems will be controlled by a software platform also developed by Leonardo and support and training for staff working on the system will be included. With over 40 years of experience in the industry, Leonardo is one of the leading providers of automation and logistics systems. Since the 1960s, the company has worked with the Italian Post Office, has played a key role in the modernization of Italy’s postal service and also boasts a number of international customers. Leonardooffers a complete range of technology and expertise in the integration of automated sorting and handling systems with ICT platforms. Russian Post is a federal post operator, is included in the Russian Federation strategic companies list. It includes 42,000 offices across the country and has one of the biggest staff – about 350,000 post workers. Every year, Russian Post delivers over 2.5 billion letters and bills (of them 1 billion letters are from state authorities) and some 194 million parcels. Russian Post services about 20 million subscribers in Russia by delivering 1 billion copies of print publications per year. The annual volume of transactions processed by Russian Post is 3.5 trillion rubles (pensions, payments and transfers). In 2015, Russian Post’s net profit was 1.6 billion, which is 28% more compared to 2014 (1.2 billion). Following the process of the reorganisation of the Leonardo-Finmeccanica Group’s companies, it should be noted that from January 1st 2016: the “Helicopters” division has absorbed the activities of AgustaWestland; the “Aircraft” division has absorbed part of the activities of Alenia Aermacchi; the “Aero-structures” division has absorbed part of the activities of Alenia Aermacchi; the “Airborne & Space Systems” division has absorbed part of the activities of Selex ES; the “Land & Naval Defence Electronics” division has absorbed part of the activities of Selex ES; the “Security & Information Systems” division has absorbed part of the activities of Selex ES; the “Defence Systems” division has absorbed the activities of OTO Melara and WASS.